Diane Von Furstenberg Fabric Spotted Cat Mink exclusive faux animal skin fabric in taupe, charcoal gray and white. 100% cotton animal print suitable for upholstery fabric, drapery fabric or for bedding and throw pillows. Spotted Cat Mink designer fabric is part of the DVF Signature Collection from Kravet Fabrics. Meet Diane Von Furstenberg. The Belgian-American designer instantly became a style icon when her signature wrap dress hit the cover of Vogue magazine. Diane’s creative approach to color and pattern has had global influence. The DVF luxury brand includes fashion, cosmetics, accessories and home goods in addition to textiles for Kravet Fabrics. View our entire selection of bright, bold and beautiful designer fabrics from Kravet. 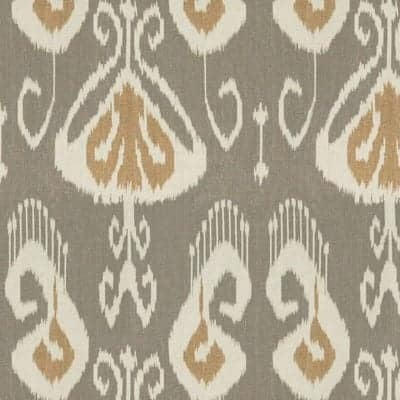 We offer the complete Kravet Fabric line, if we haven’t added it yet please email us at customerservice@1502fabrics.com or call 336-803-3569 for the best price on Kravet. Give us a call we are friendly and helpful!